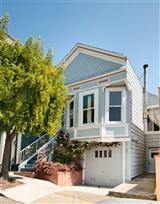 Here’s a pretty neat Bernal Heights Cottage at 153 Wool that has a very flexible floor plan. Well-located on the North side of Cortland, this Edwardian cottage is a single family being used as two units. Upstairs is two bedroom, one and half bath and the lower level is one bedroom, one gorgeous remodeled bath. Home office, art studio, or guest quarters-lots of flexibility. What I found really cool about it, is that each level has it’s own designated outdoor area, so if used as two units-as a residence and perhaps a home office, each has it’s own space. Bonus, they are pretty secluded from neighbor view. Nice Edwardian detail intact and a sensitive, modern remodel. Entire property is occupied by the owner and listed for $999,000. Available to see by appointment. After only a few weeks on the market, the property was withdrawn from the market, although MLS shows that the property is still available for sale off the market.